Cardiff City have completed the transfer of prolific striker Jason Byrne from Irish champions Shelbourne. The 28-year-old Republic of Ireland international impressed after a short trial and finalised his move after passing a medical on Wednesday. 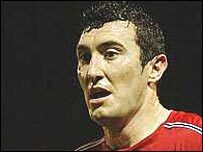 Byrne has been the top scorer in the Eircom League for the past four seasons, amassing 83 goals for Shels. "He's been training with us, but his season ended in November so he needs to get fit," said Cardiff boss Dave Jones. "He needs a few weeks hard training under his belt and then we'll give him an opportunity. "He loves it here, he wants to do well and he wants to come across the water to see if he can apply his trade. "He's scored a lot of goals at the level he's played, can he do it at this level? We'll find out soon." Cardiff's promotion push has faltered over recent weeks as the goals have dried up for their strikers, managing to find the net just three times between them in the last 13 games. The Bluebirds had a £1m offer rejected last week by Luton for striker Rowan Vine before he joined Birmingham for £2.5m. "We're still looking around for more signings," Jones told BBC Sport Wales after the 4-0 FA Cup replay loss at Tottenham, the Bluebirds' 13th game without a win. "The lads need help and one or two need to come out of the team - but we need to put in better players than we take out. "The legacy left to this club was rubbish and now we're trying to put it right. "It may take a little longer than we thought at one stage, but we're a wounded animal now - and they are often the most dangerous."